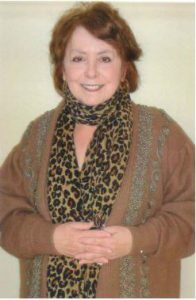 Rosemary Burgo has written poetry since age 7, as a way to handle life’s difficulties. And in the months before her death at age 70, writing poetry helped the Mount Laurel woman craft the final chapter of her life, and her legacy to others coping with illness. Since becoming terminally ill from heart and lung problems and entering Samaritan’s hospice program in February 2015, Rosemary has found new inspiration for her writings with the encouragement of her hospice chaplain. These interactions spawned an outpouring of recent works, including powerful poems and thoughtful meditations, that captured her insights and feelings about life, illness, and death. These words proved particularly prophetic, as Rosemary succumbed to her illness just days after completing final edits on her poetry collection – Reflections Toward Eternity. Her desire to make the most of her remaining time also drove Rosemary’s decision to enroll in hospice – and why she chose Samaritan Healthcare & Hospice. Indeed, Samaritan has provided a range of supports to Rosemary in her home, including multiple visits each week from a staff nurse, social worker, home health aide, and chaplain. Plus, she’s received massage therapy to lessen back pain. Learn About the Right Way to Begin the Hospice Conversation. The amiable senior especially enjoys her time with Chaplain Anne Butts — which often includes discussions of her poetry. In fact, with Rosemary’s blessing, Anne has shared poems with other Samaritan patients, as a way to help them overcome their reluctance to discuss end-of-life issues. In keeping with Rosemary’s wishes, the chaplain will also offer in-service training for her social work and spiritual support counselors. Her goal is to make them aware of this resource and foster their use of it with patients and caregivers as appropriate. Many pieces reflect the difficult emotions both patients and families can experience, from sadness to anger to regret. “The poems show people it’s OK to feel these things and to talk about them,” says Anne. Faltered greatly and, for that, I am truly sorry. Throughout her life, Rosemary has found comfort and healing through such self-expression. Even as a young child, writing eased the impact of harsh, callous parents. “It’s a way for me to be true and honest, and to keep that little girl inside me alive.” She has also written poems to her close friends and relatives, as a way to communicate her love and appreciation for them.